The height of squirrel's popularity has come and gone - or has it? Up until 1975, The Joy of Cooking included an illustration and description of proper squirrel skinning within its pages. But in the past four decades, squirrel cuisine has dwindled to a rarity, even among hunting families. While eating gray squirrel was a staple of this writer’s childhood diet, when I ate pulled barbecue squirrel five years ago at a Christmas Eve dinner, it was more of a novelty than a menu staple. And that’s unfortunate. Locavores, listen up: if you want to eat non-GMO, antiobiotic- and hormone-free, lean, free range, local, healthy meat, you need to look up. Limb chicken, as squirrels are affectionately known in many hunting circles, is arguably better than grassfed beef or organic pork when it comes to planetary health. This isn’t to suggest that squirrels should be eaten instead of beef, but rather in tandem. In fact, many small beef and dairy farms are ideally positioned to create the perfect squirrel habitat. Large ruminants, moving through hardwood forests, graze and trample undergrowth, creating the type of park-like habitat ideally suited to squirrel populations. So enjoy your free range hamburger, but try it with a side of squirrel pie. How does it taste, you ask? Would it be trite to say it tastes like chicken? Because it does taste a bit like chicken: the darkest of juicy, dark thigh meat, with some nuttiness and gamey flavors added to the mix. It’s good. Believe me: I wouldn’t be telling you to eat it if it wasn’t delicious. Even though their menu popularity may be dwindling, squirrels are the most popular small game quarry with 1.7 million hunters stalking squirrels, according to the 2011 National Survey of Fishing, Hunting, and Wildlife-Associated Recreation. 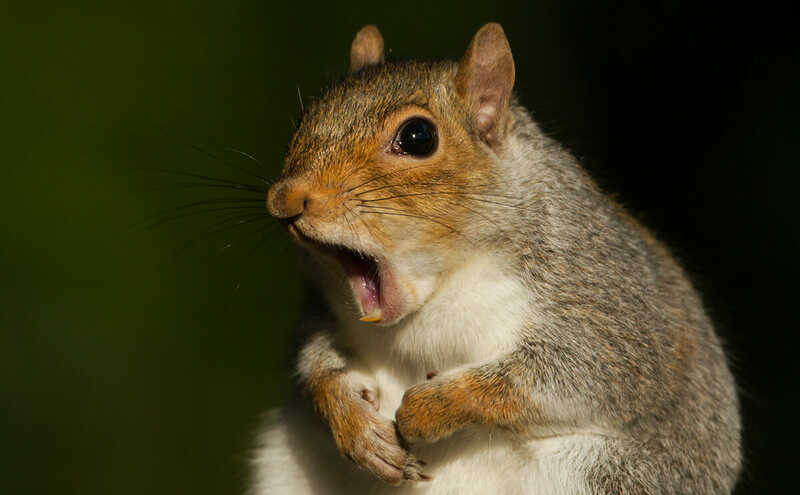 If we’re talking about hunting urban squirrels (though I’ll take an acorn-fattened squirrel over a trash-can-and-peanuts-fattened squirrel any day of the week), there are legal issues that probably make it more hassle than it’s worth. Hunting a country squirrel has less restrictions, but it’s certainly no breeze. A 22 rifle shot to the head is the cleanest and most humane way to dispatch one. It’s no easy shot, though — squirrels are small and wily! Even when the shot is clean, skinning squirrel isn’t the easiest of tasks. While skilled hunters can skin a squirrel in less than two minutes, most mere mortals or weekend squirrel warriors should expect to dedicate considerably more time. For best results, use a razor sharp knife to cut the hide at the base of the tail, cutting through the tailbone between the joints and keeping the hide intact. Then step on the severed tail and hide, pull the hind legs, one in each hand, straight up. The hide should peel off the body leaving a cleanly muscled carcass. Of course, if all of this sounds like too much for you, making friends with hunters may be your best bet. By crowdsourcing your friends and family, you will likely find yourself within a few degrees of separation from a squirrel hunter willing to share game or even teach you the ropes. This is one of my favorite meals, I am a huge umami fan and this recipe is full of earthy flavor. Using full racks of squirrel or rabbit gives this sauce incredible depth, as the rendered fats and the marrow will add a bunch of savory glutamates. Rendered squirrel fat has a relatively low melting point and is a wonderful oil to work with, adding soft nutty undertones to the dish. If you ever harvest a nice plump squirrel or two, you would be doing yourself a great favor by rendering the fat. To render, simply place 3 to 4 ounces of fat in a small sauté pan with 2 tablespoons water. Slowly fry the fat tissue until it is crispy like well-done bacon. The water will have evaporated and you can pour the liquid fat into a sealable plastic bag and freeze for up to 9 months. You can break small pieces of the frozen fat off for use, while saving the rest. 1. Season cleaned trimmed squirrel racks with salt and blended pepper. 2. Heat 1 tablespoon of olive oil and 1 tablespoon squirrel fat in a heavy saucepan over medium-high heat. Sear each side of the racks for 2 to 3 minutes. 3. Remove racks from pan and add 1 tablespoon olive oil and 1 tablespoon squirrel fat on medium heat. Sauté the diced onions, carrots and celery, stirring occasionally until they are beginning to soften, 5 to 8 minutes. Then add half of the sliced fresh mushrooms and chopped garlic. Continue to cook, stirring occasionally, for 5 to 6 more minutes. 4. Remove pan from flame and deglaze with the white wine, return to flame and continue to cook for 6 to 8 more minutes or until wine is nearly reduced. 5. Add the duck stock, thyme, bay leaves, whole grain mustard, and dried mushrooms. Stir and add racks back to the sauce pan. Bring to a low simmer, cover and continue to cook for 90 to 120 minutes or until tender. Remove racks and let rest. 6. Add the heavy cream to the sauce and bring back to a simmer, reduce sauce by ¼ and season to taste. 1. Heat 1 tablespoon olive oil and 1 tablespoon duck fat in a sauté pan over medium-high heat. 2. Add cleaned and snipped green beans and the other half of the fresh sliced mushrooms, season with salt and blended pepper and cook, stirring occasionally, until al dente, 10 to 12 minutes. Make wild rice by following package instructions of your favorite blend. Fill two-thirds of the plate with the wild rice and beans. Lean rack of squirrel against green beans and rice and spoon pan sauce over rack.